Steph and Boyd talking about what happened in Tasmania and that he is a married 19 year old. Frazer admitting to Rosie that he cares for her and she should talk about what happened in the cellar with Paul. Rosie is hung up about what happened in the cellar but Frazer tells her she isn't all to blame and that he shouldn't have been giving out signals even if Rosie admits she was the one who made the first move. She is despondent too because she thinks she's blown the job too…for getting to know the boss a little too literally. All the ladies (Janelle, Janae, Susan, Elle, Steph and Lyn) are in a hotel for the hen night/a night of pampering. First question up is where the honeymoon is (Maldives) and Janelle notices the look on her daughter's face and reminds her that they could have had a different type of wedding! Janelle then totally lowers the tone…by asking if Paul has a special leg for the occasion! Everyone is literally speechless and when Janelle tries to push it, Steph and Elle both want the topic of conversation changed! They are however in stitches when Janelle then asks if he takes (the leg) off before going to bed and Elle promptly announces a toast to Lyn – hoping that she tames her monster of a father! Rosie is still going on about Paul and doesn't answer Frazer's question if she is hung up on him…or if she loves him. Susan is trying to do the mothering routine and trying to get everyone to pace themselves so the bride isn't hungover but Janelle isn't exactly keen on that idea especially when a knock at the door indicates the arrival of the stripper! Susan accuses her of lowering the tone of the night but Janelle does a bit of quick thinking when she goes to let the stripper in - he is to keep his clothes on because he is now a professional masseur! She puts some money down the front of his trousers and tells him to follow her lead. JANELLE: This is Sven from Sweden and he doesn't speak any English. (Pushing him in Lyn's direction) Just go to the bride to be and give her one of your famous Swedish massages. (He starts massaging Lyn above her dressing gown). ELLE: And what about the costume? SUSAN: Janelle I'm so sorry. I had you pegged all the wrong. Obviously money can buy taste. JANELLE: You can't handle it can you? I've moved up in the world and your hubby has gone from doctor to dole bludger. Frazer is trying to work out why Rosie got attracted to Paul in the first place and she explains she is having trouble controlling her feelings. He blurts out and asks if it is love but she replies back for him to give her a definition of it and then she'll answer. Frazer starts having a go at her for what she did especially given Paul's reputation and the fact Paul is old enough to be her father but she decides she isn't listening to it given the games he has been playing with Pepper and herself since he moved in. He protests his innocence and says that he wouldn't cheat on the woman he loves which causes Rosie to burst out laughing! ROSIE: I give up. I can't trust any of you men. I'm sick of men full stop. Since the ladies are otherwise engaged, Paul is left in charge of babysitting Oscar and Boyd comments that he's been feeding him junk food all afternoon when he brings over another supply of food and tells Boyd to lay off because it's his buck's day! Paul leaves Oscar with a plate of food to talk to Boyd at the bar - he wants them to have a fresh start given Boyd is going to be his ‘grandson of sorts' and extends his hand. BOYD: I reckon I'd rather eat dirt than shake your hand Paul. Paul remarks that he doesn't want to be grown up over it and Boyd explains why – he threatened him but Paul sees that as a joke, adding “who haven't I threatened?” Boyd then politely asks Paul not to refer to him as his grandson again just as Frazer walks into the bar. PAUL: Lurking behind a rack were you? FRAZER: You are scum for making her think it was her fault. Frazer then congratulates him for making Rosie think he made a pass at her, which Paul protests that she did, before Frazer adds that Rosie would never go with someone like him. PAUL: Look the truth however unpalatable it may be for you is that she did make a pass at me, I rejected her. The fact is I'm just not attracted to her but you shooting off at the mouth is only going to cause Lyn and Rosie further pain and embarrassment. I think Rosie has suffered enough without you making it worse. You see the thing is I'm going to be marrying the woman that I love tomorrow and I have no intention of jeopardising that, now if you'll excuse me I have a son who needs a bath. Rosie enters Frazer's room looking for company because she can't sleep and apologises for snapping at him earlier. She asks his advice on whether she should tell Lyn what happened or not but he firmly says no because it wasn't Paul who instigated the kiss. Rosie is surprised at his change in tune so he replies that she shouldn't ruin their relationship just so she can have a clear conscious. “I guess,” says Rosie before Frazer asks if she wants to break them up…so she can have him all to herself. Rosie firmly says that she doesn't want Paul…anymore. The two of them are now lounging on the bed talking about their worst Christmas pressies and Frazer starts to talk about his family while Rosie puts her head down. FRAZER: Not much to tell really. It's been so long since I was home. Dad's a Rolling Stones freak, mum's more of a Beatles fan. Honestly my family are really boring. Actually, eh, you already know my brother. Man I've been meaning to tell you this for a long time but the timing has never been right. You know Johnny, the guy your parents wanted you to marry? He's my brother. I thought he was the luckiest guy on earth. He had his ticket out of our boring family and he was going to be a Cammeniti – money, power, status so when you did your runaway bride thing I thought I'd track you down and win you for myself. Pretty low I know but then I got to know you and realised how incredible you are and now I couldn't give a stuff about the money or the connections, I just want you. Frazer then realises he's been confessing all while Rosie has fallen asleep! Steph tries to get her mum out of the bathroom to show then all how she looks but when she does reveal herself she is still in the blue dressing gown, because she doesn't want to get ready too early. Steph then gives her a pressie on behalf of all her kids, and Lyn wishes Jack and the girls were here before opening up the box to reveal a beautiful pearl tiara. Lyn is overjoyed with it and shares a tender mother/daughter look with Steph before saying that she has been blessed with beautiful children, beautiful friends and now is about to marry the man of her dreams. So what did that make both the Joe's, Joe Scully especially! We then cut straight to No. 22 where Paul is fraught because he can't get Oscar into his suit while the little man runs around the livingroom playing with Paul's prosthetic leg! Lyn's solution from the hotel is to put him in front of the telly but he begs her to come home because he can't control the wee man. To the shock of the ladies, Lyn announces that she'll be right there until Steph tells her it is bad luck to see him and that she'll go instead but Susan says Janelle say they will go to sort it out, telling Lyn to get ready! Rosie is shocked when she enters the livingroom to find that Frazer has made her breakfast. She is after him to fill in the blanks because one minute she was chatting to him, the next she was waking up in his bed. “Don't tell me you've forgotten,” says Frazer and of course she hasn't a clue what he is going on about, so he winds her up before they start laughing and tucking into the brekkie. When Rosie is wondering how she'll get through the day, he announces that she's won an action packed day with him and he isn't taking no for an answer. Oscar is still running around but least without Paul's prosthetic leg this time and Susan tries to capture him to get him dressed. Paul is amazed at how much energy the little tacker has and he is relieved when Janelle tracks down his leg. He then notices the time and thinks they won't make it to the church on time, which Janelle is surprised at given this is his 4th wedding and think he should have it down to a T by now! Susan suggests he goes and gets ready and leaves Oscar to them, which he is very thankful of. He leaves and Susan goes into nice school teacher mode! SUSAN: Now darling, you are going to look so grown up in this suit. Wouldn't you like to go and see mummy all dressed up? JANELLE: (whispers to Susan) Psycho battle ain't going to frighten this cheeky, chick. You've got to show him whose boss. SUSAN: (taking Janelle aside) We are not going to terrorise the kid alright! This is a very unsettling time for him. 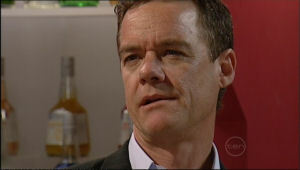 Paul shouts from upstairs that he can't find his tie and Janelle sends her off to see Paul while she sorts out Oscar. SUSAN: No tough love. Be gentle. JANELLE: What you think I am? Some sort of monster? JANELLE: Look, I dropped the law suit against your husband; it might not pay to insult me. SUSAN: Are you going to drag that up as ammunition every time we disagree? JANELLE: …well ‘til something better comes along. Susan shouts that she is coming and wishes Janelle well with buggerlugs. JANELLE: Okay. So…who wants a doughnut? ( Oscar plays with his binoculars) Only if you are a good fella and put on your suit then you can have anything you want. Oscar stops playing with his binoculars but puts his right hand over his face but leaves a gap to look through to see the doughnut Janelle is holding up bribing him with. Boyd reads a card Glenn from Tasmania has sent him – hoping that he has a wonderful Christmas and that she'll be thinking of him and them in the New Year. Ooh mysterious. But he quickly hides it when he hears Janae moving around and announcing that Charlie is ready. She enters the livingroom and chastises Boyd for not being happy about the wedding but he tells her that Paul is just going to break Lyn's heart by cheat on her…if he hasn't already. JANAE: Some people can resist temptation Boyd. Naturally it is a dig at him about Tasmania and he replies that he though they put it behind them and Janae replies that she is trying. Janae then explains to him that she wonders if he is thinking about ‘her' when she sees him staring into space. Boyd promises her that he isn't and adds jokes he is nothing like Paul…and that he can't wait to marry her again properly. They kiss and hug each other but Janae isn't exactly full of the Christmas spirit. Susan is one annoyed lady! Turns out that Oscar ate the whole bag of doughnuts he was bribed with to get dressed and promptly threw up over the two of them! The two of them continue trading insults like they've been doing for the past two days while they clean the sick off of themselves. They are starting to run out of time and Janelle announces she is going to take off the lovely dress she has on and wear something else but then has a sudden inspiration…and starts removing the decorations from the tree. SUSAN: (as Janelle starts handing her baubles) What! SUSAN: Don't be so ridiculous. I'm not going to jingle jangle down the aisle its Lyn's big day. JANELLE: Well she's got no fashion sense anyway. You should see that jumper she made Paul wear last week. SUSAN: I know. It was appalling wasn't it? Janelle and Susan start laughing before they stop…to dress themselves up in Christmas decorations from the tree! SUSAN: At least get something that's dignified! Get the tinsel! Frazer and Rosie are on the way to their mystery destination when the car shows signs that it is about to break down, so he pulls into the side of the road momentarily while he thinks of a plan. His cunning plan is for them take the failing car back to Ramsay Street and to take her car instead. She is reluctant to do that because she doesn't want to run the risk of running into Paul but he assures her everyone will be at the church as they set off back to Ramsay Street. Keith the ancient minister talks to Paul but it looks like Paul would rather not be chatting while he waits for his bride as he is very nervous. While Keith says that brides like to make a big entrance, we continue the 2006 theme – flashbacks and dreams! This time, Paul is dreaming of Rosie and she seductively walks down the aisle before stopping, turning and walking back down the aisle just as the dream ends. 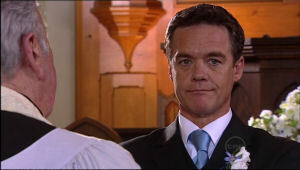 PAUL: It will all be over when I'm married to Lyn. Paul quickly says “nothing” before taking a quick look at his watch and deciding he'd better see where Lyn is but not before telling the minister that he wants things to start immediately when he gets back. Another road somewhere…which actually turns out to be the road the church is on! Frazer and Rosie are crawling back to Ramsay Street in the car and just so happen to pass the church where Paul is waiting outside for Lyn to arrive! Oops! A frantic Rosie wants him to turn the car around but he points out that would talk longer than continuing to drive on and suggests she ducks down instead. Too late though because they've spotted each other. Paul is still in a daydream when the cars start to roll up and Elle leans out the window telling him to get inside. He does that as Steph, Elle and Lyn get out of the car. LYN: Mrs Robinson here I come. Steph gives Lyn her blessing to the union because she knows the two of them are going to be deliriously happy and Lyn hugs the two girls. LYN: We are one big family now. Susan and Janelle arrive in her Audi, apologising for being late. Lyn just wants to know where Oscar is and Susan says he wanted to go with Boyd & Janae and will be in the next car. Lyn then spots the new accessories that the ladies are wearing and they promise to explain later. Keith asks if they are ready to go and bizarrely Lyn says yes when her son and grandson still have to arrive! Steph and Elle head into the church closely followed by the bride and bridesmaids. Keith begins the wedding by reading out the necessary religions spiel. Annoyingly we cut back to No. 30 to see Frazer and Rosie arrive home. He just wants them to collect her car keys so they can continue with their plans but Rosie heads straight for the sofa and lies down hugging a cushion in the foetal position. Back to the church and Keith has finished the religious spiel and we now have a full compliment of guests. 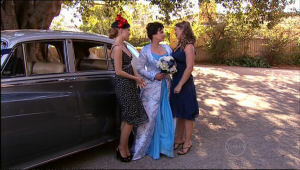 Lyn hands her bouquet to one of the bridesmaids before turning to face Paul. 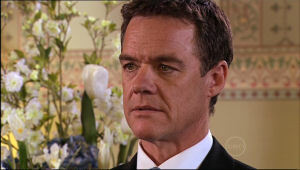 LYN: I, Lynnette Scully take you Paul Robinson to be my lawfully wedded husband. I will love, honour and cherish our marriage through the good times and the bad times. 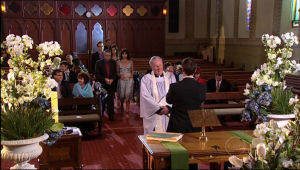 Lyn puts the ring on his finger before continuing with the vows. LYN: I will be true to you Paul all the days of my life. Steph and Elle smile on from the pews as the minister asks Paul to say his vows to Lyn. The congregation look nervously at each other and Keith prompts Paul by asking if he takes Lyn to be his lawfully wedded wife, ‘til death do them part? Its like rewinding back to 2002 and episode 4007 when it was Steph and Marc at the altar, and the groom having doubts about getting married as Lyn says “Paul”. Annoyingly we again cut back to No. 30 and Frazer is hunting for Rosie's keys while she still remains in the same foetal position and ignores him when he comes in with the now found keys so they can head to the race track. ROSIE: He's probably saying ‘I do' right about now. Paul is still looking like a stunned mullet as Lyn nervously looks around at her bridesmaids and the minister tries to get his attention, which miraculously happens at the second attempt. KEITH: Paul Robinson, do you take Lynnette Scully to be your lawful wedded wife? Lyn is starting to look rather worried now and calls out “Paul” as we head into the preview, probably exactly like her daughter felt at the end of episode 4007.